Oliver Reed plays a man whose sister believes she is seeing her other missing brother. This so-called brother proves the be real, and shows up knocking at their door. The only problem, of course, is that it’s rather clear he has a completely different head than the missing brother. But who pays attention to things like facial bone structure anyway? The “evil imposter” has worked in horror films in the past, but this film just plodded along too slow for me. Still, it did keep me mildly interested (I looked up from my Great American Novel several times). The more engaging parts stemmed from the acting talent of Oliver Reed. Oliver Reed played a man who has a form of psychosis himself, a la "Incredible Hulk" style. The battles between his own mind and the imposter situation showcased his top notch acting. But I left the film feeling this multi-faceted personality of Oliver Reed’s character could have been written stronger (when you have a talent like Oliver Reed, you should use him to the extent of his abilities). Instead, it seemed to be kind of “passed over” by the script writer. 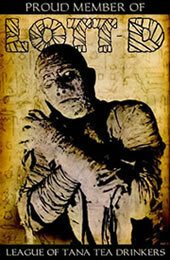 A pity, as this was probably the difference between a mediocre movie and a truly great piece of classic horror cinema. The ending was rather obvious, but Hammer was not particularly well known for surprise endings, unless they include Peter Cushing swinging across the room on a rope like Tarzan. All and all, the film wasn’t bad, but it wasn’t mind-blowing either. If it was playing on television and nothing else was on, I would probably watch it. 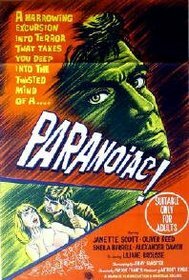 But I will also probably never hear my inner voice saying, “Hey, why don’t you pop in Paranoiac tonight?”. So it will spend a life of obscurity on my video shelf along with "The Star Wars Holiday Special" (I‘ll make sure to put them on separate shelves. Paranoiac doesn‘t deserve that horrible of a fate). Fans of Oliver Reed should enjoy it well enough, and it’s an important film for all Hammer completists (who am I kidding? I’m the only one of them. Do you have a movie entitled Man Bait on your shelf? I didn’t think so). Diehard classic horror fans should find some enjoyment out of it, but if you’re a casual fan... stay away. Go pick up a Peter Cushing or Christopher Lee feature instead. Submitted by William Yeates (not verified) on Tue, 2010-03-30 14:45.
unlikeable as the family's Aunt. book is excellent, the film is throughly enjoyable and I recommend it.